IT’S NOT EVEN BEEN A WEEK! 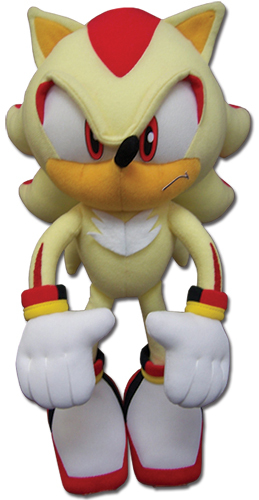 Well, there’s no stopping GE Entertainment is there, surprising everyone since they haven’t even teased this, GE have announced a new plush to their Sonic line, and as before it’s one which has never been released in a plush form before. Thats right, Ow the Edgehog, as many call him, will soon be available in his super form for the first time ever. Plush stands at 10 inches tall, no pricing or release date yet, as is usual with these things. And once again you’ll have to resort to Ebay/Amazon sellers in order to get one… no I don’t understand why this is still a thing either. So Blue Believers what do you think of this? Like it? Hate it? Needs more Edge? Let us know in the comments. It seem’s Toys R Us can’t get enough of our favourite video game franchise, after the exclusive Sonic Unleashed posable Werehog action figure’s you can now pre-order two new figures exclusively at their stores/website. Posers – Super Sonic The Hedgehog and Sonic Super Posers – Super Shadow The Hedgehog. Bet you can’t say either of those fast without stopping for breath. Both are extremely posable with (as the packaging puts it) “Over 25 points of articulation”, great for those battles with your sisters Barbie dolls. Each figure costs $10.99 and their estimated ship date is 05/10/2009(that’s 10th May 2009 for us Brit’s). No sign of the figures on the UK Toys R Us website at the moment but we’ll let you know if they do turn up.